Putting aftermarket stuff in the car dashboard is a favorite American pastime, and the iPad mini got the treatment just hours after its launch today. 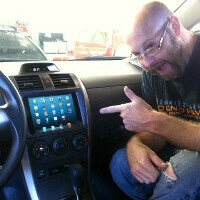 Soundwaves of Tampa installed Apple's smaller tablet in a 2012 Toyota Corolla immediately to use it as the car's infotainment system. The iPad mini is used to stream Pandora and iHeartRadio through the Corolla's sound system, probably getting its Internet fix via a Mi-Fi unit somewhere in the car, as the LTE version is still not out. We've seen some crazy iPad-laden rides before, but this one takes the cake in speed of installment just hours after the iPad mini went on sale. Not bad for $329, and we are sure more such setups will be appearing in no time. Well that's probably the best use of an iOS product - a car dash or a kiosk ad. You are kidding right? I would love to put a REAL tablet like a Nexus 7 & then we would be rolling in high tech! the N7 is a disposible tablet you cannot be serious about being a real tablet... is a budget tablet gets cheaper and cheaper as we speak..
People have already put tablets, such as the Nexus 7, into their dashboards. I don't see why it's such "news" when it's done with Mini. Not wanted to say that you probably to get lost in city. You...you cannot be that dense. Seriously I mean you just...you just can't. And the best part is a moron did it for his Corolla. Apple users and Toyota drivers go well together - both are lifeless appliances. Androids are pieces of S**t compared to Apple. Also What do you drive? Yeah moron, a person like a "user and a driver" are lifeless applications. If you're trying to insult somebody, at least get subject within the noun correctly. Since your post was from 2012, hopefully you're dead by now to make way of doing society a big favor. It is already installed in my Hummer H2 SUT and link with my Bose sound system. Nice! I've been itching to do this with a nexus 7 since you guys showed that article a couple months back. Just cant afford it yet. The picture of this idiot says it all. Typical fanboy. You are without question a complete idiot. That's the installer that created the flush mount, and the mechanism to put the tablet in the dash. Get your facts straight. Well it makes three f ags now... the owner, the installer and you. Don't get all butthurt becuase someone is talking about another fanboy, sorry I ruined your circle jerk. Yup, you're right. Because your original comment says "The picture of this idiot says it all. Typical fanboy." Clearly it shows you're not talking about the guy in the picture. Talk about someone getting butthurt? Ha! You get called out on a BS statement and get upset like a little B*$%h. I'm done with this, have fun trying to look tough online, dumb@$$. I would love to do a tablet dash, but I would need tablet to be removeable since I wont actually use internet connectivity for it, but just use it for music and whatnot, so it would need to be removeable so that I can load new music and whatnot for it. Ahh.. who cares.. or gives a rats buttocks? That thing is mad outdated. 2.3 really? probably no dev. support, cool idea, and about the same price as a custom job. I have a car adio buddy who told be I'd be looking at like 5-600 for a nexus 7 installed with an amp and some control doodad and a bespoke "stock looking" mount. So what happens when the iPad has an issue? Is it removable by the owner or do they need to take it to the customs shop that installed it? Or should Apple invest in Apple Auto Centers and start doing this themselves? Wait so how does it play music through bluetooth or something?